Nauman is an American sculptor who works with words – performed, recorded, painted or scrawled in neon tubing. His 2009 Cagean sound installation at the ICA and his ‘Mindfuck’ exhibition at Hauser & Wirth, London are just two examples from recent years. Installation photograph by Sarah Snaith. Top: Bruce Nauman, Raw-War, 1971. 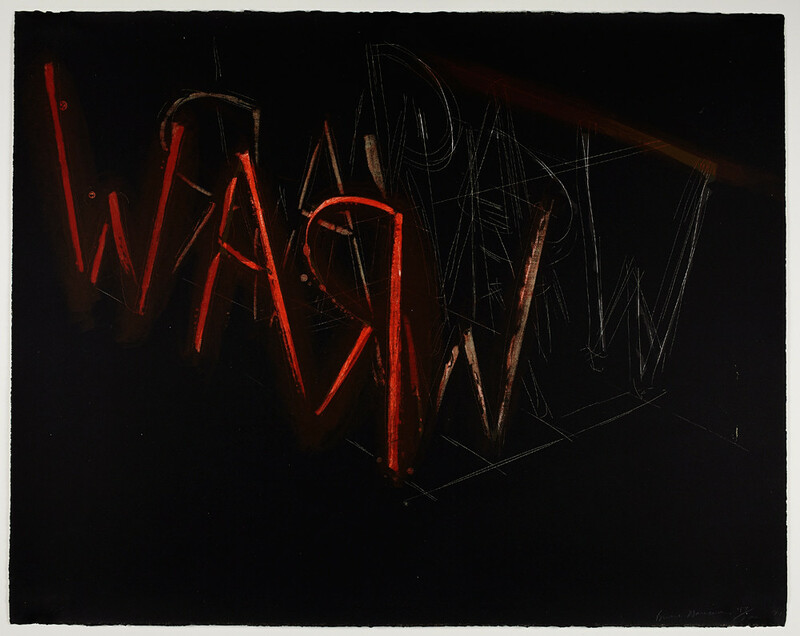 © Bruce Nauman / SODRAC (2014). Like conceptual artist Lawrence Weiner (see ‘The work must be read’ in Eye 29), Nauman’s early work is credited with influencing waves of artists and graphic designers. 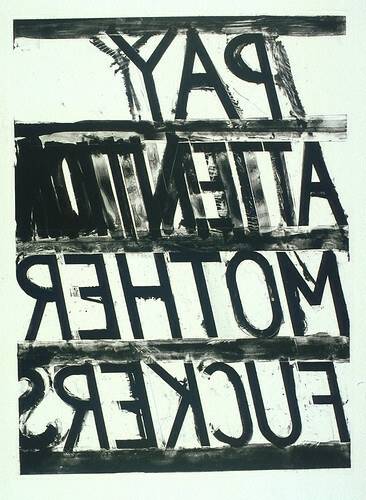 Some of Nauman’s text-based images have a deadpan humour about them – the sober print reading AH HA, the triptych ‘Perfect Door’, ‘Perfect Odor’, ‘Perfect Rodo’ and three drawn violins accompanied by the word ‘violence’ demonstrate his playful exploration of language and its associations. But for the most part the works possess an angst and, from the streaky line-work and reversed / backwards texts found in the screen-prints and litho prints, there is the lasting impression that you, as the viewer, are looking out of the work rather than on to it, looking through a hand-painted pane of glass obscurely yelling to passersby, ‘Clear Vision’, ‘Oiled Dead’ ‘Life Mask’. Bruce Nauman, Pay Attention, 1973. © Bruce Nauman / SODRAC. The video installation Good Boy Bad Boy, 1985 (one of two pieces in the exhibition which breaks from paper) plays on a loop in the gallery on 1990s looking thick television sets mounted on carts with casters. It recalls the portable classroom media equipment of secondary school, as does the repetitive and intense statements recited by the characters, a white middle-aged woman and a young black man. Part of the script has the woman saying, ‘I am virtuous, you are virtuous, we are virtuous men, this is virtuous’ while the man recites, ‘I like to sleep, you like to sleep, we like to sleep’, their voices continuously cut each other off. Other works on display include Sugar/Ragus, Doe/Fawn and Tone Mirror. 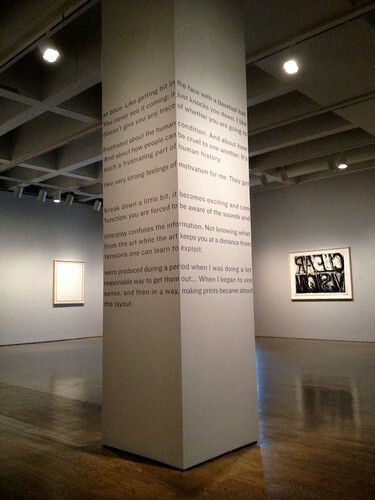 In the larger gallery space, two columns feature Nauman’s text in French and in English. This obliges viewers to encircle it several times, introducing a performative (and potentially dizzying) element to the exhibition. Photograph: Sarah Snaith. 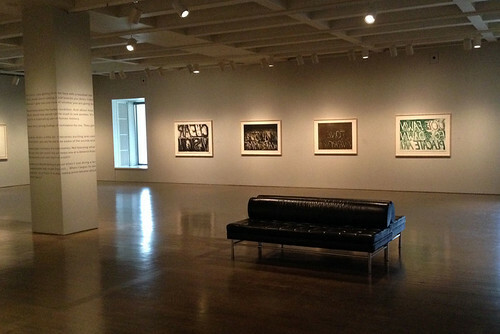 Nauman’s commentaries sit alongside his work sits alongside it, such as in Sugar/Ragus. There are many instances where language is necessary to shed light on a piece of work, to draw attention to elements or influences others may overlook. Here, however, it can feel as if Nauman’s texts are there to thwart interpretation, diminishing the imaginative musings of his viewers. ‘Bruce Nauman’s Words on Paper’ continues at the Art Gallery of Ontario (Musée des beaux-arts de l’Ontario) in Toronto until 4 May 2014. 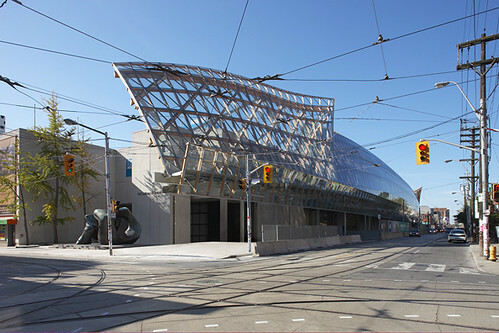 The Art Gallery of Ontario from Dundas Street. Architect: Frank Gehry.